Coronary heart disease remains the single largest killer of American men and women. The American Heart Association statistics show that approx 1.1 million Americans suffer a myocardial infarction (MI) annually. Of those who survive, 22% of men and 46% of women are disabled with heart failure (1). Although cardiomyocytes of infarcted or failing human hearts have been shown to undergo mitoses (2,3), this regenerative capacity is by far too limited to compensate for the loss of cardiac cells resulting from a large infarct. In areas of ischemia, cell death ensues and scar forms in the place of myocardium. The remaining myocardial cells respond to mitotic signals by hypertrophy rather than hyperplasia. Necrotized myocardial cells are replaced by fibroblasts. If no viable myocardium is present, scar formation ensues with ventricular wall thinning and dilation of the ventricular cavity. This leads to symptoms of heart failure in a significant number of patients. 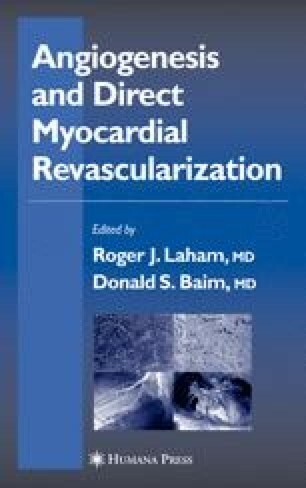 For conventional coronary revascularization to be beneficial, viable myocardium must be present. The prognosis for these patients is poor, with a 1-yr mortality rate of 20% and a 5-yr mortality rate of close to 50% (1).